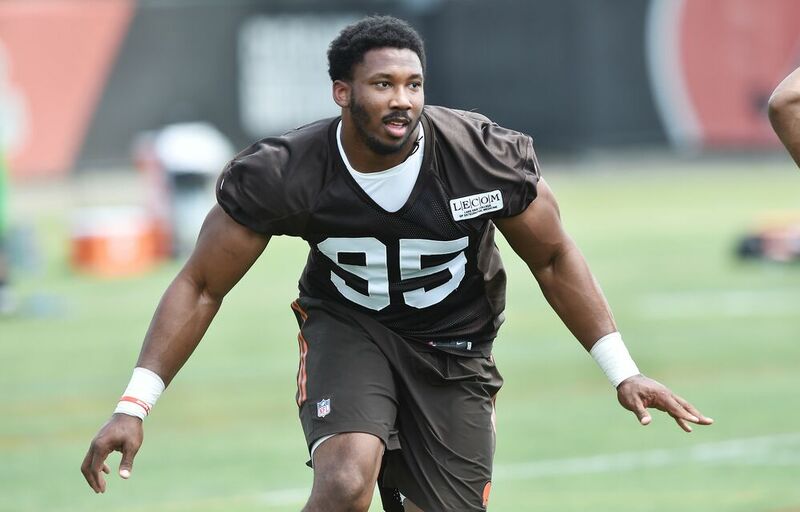 The Cleveland Browns breathed a sigh of relief with the news that Myles Garrett should be fine for training camp after suffering a sprained foot. Myles Garrett suffered a foot injury earlier this week that causes an early panic among Cleveland Browns fans who were already wondering if the top pick in the NFL Draft was already a bust. They can all relax now after the Browns diagnosed Garrett with a lateral foot sprain that won’t prevent him from participating in training camp in late July. According to Mary Kay Cabot of Cleveland.com, Garrett is still in a walking boot after suffering the injury in minicamp on Wednesday and will continue to receive treatment over the next few weeks. Browns training camp opens on July 27 and Garrett should be able to ramp up his activity then. He may be slowed at the onset of camp, but he should be ready to play in preseason games and practices with this diagnosis. The Browns will be wise to monitor his recovery and not run the risk of rushing him back too soon and risk suffering a setback in his recovery. After all, the Browns aren’t competing for the division this year and the development of the No. 1 pick in the NFL Draft is imperative to the team’s rebuilding effort. Garrett played through a sprained ankle during his final season at Texas A&M last year that resulted in him recording a career-low 8.5 sacks for the Aggies. The Browns know he’ll want to play through the injury, but playing it safe and making sure he’s 100 percent could be the proper course of action for the talented rookie. It can be frustrating for a competitor like Garrett to watch his teammates on the field while he’s on the sideline in a walking boot, but as long as he’s ready by late August, he’ll be able to produce at a high level for the Browns.